Start with my reviews of The Maze Runner (book one) and The Scorch Trials (book two). 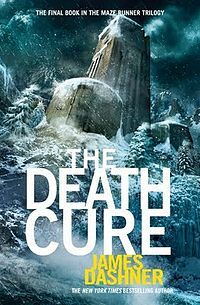 The Death Cure delivers the exciting conclusion to the Maze Runner Trilogy. (It’s better than book two.) Thomas and his friends have escaped the Maze and survived the Scorch, but are the trials really over? WICKED has told them they are, but Thomas, Newt and Minho have been lied to and manipulated so many times, they don’t know what to believe. So they refuse the removal of the memory swipe and escape. And they enter a world where the Flare is decimating humanity. Be warned, Dashner’s world is a desolate, violent, hopeless place. Denver, at first, gives the illusion of hope and normalcy, but darkness lurks just beneath the surface. The infection rate is escalating, Cranks (the infected) are outnumbering the well, and it’s only a matter of time before the whole population of the earth succumbs to the disease. And Cranks don’t make good neighbors. The Flare infects the mind, driving people to insanity and cannibalism. Survival or the human race seems impossible. WICKED is working on a vaccine. Or so they say. That, at least, has been the whole point of the Trials, to study brain patterns in hopes of a cure. After a sojourn into this crumbling society, Thomas swallows his hatred for WICKED and returns, hopeful that his doing so might contribute to a cure. But their methods have never settled well with Thomas, and this time, they ask much more from him than he can possibly give. As Thomas never does accept the removal of the Swipe, we never fully learn what his role in WICKED was in the past. But we learn enough. And by the refusal, Dashner keeps his readers in the dark a while longer, effectively maintaining the suspense that has driven this entire series. (It was nearly aggravating enough to make me scream.) And coming to the end, when I finally understood this world, the conclusions weren’t completely satisfying. I’m a sucker for a happy ending, and this one has a complex mixture of hope and dismay. But it’s REAL. It works. It couldn’t end any other way. Now for my personal commentary. Let me reiterate that this is YA and not intended for a younger audience. One of the main themes is whether the end justifies the means. It is a dilemma that the reader is left to struggle with repeatedly. The book also contains violence. Cranks, as I mentioned, are not pleasant. And survival drives Thomas and his friends to desperate acts. At one point, someone close to Thomas contracts the Flare and, on the verge of insanity, begs Thomas to shoot him, which Thomas does. Intended or not, this does create a social statement about when it is or is not appropriate to kill a sick human. The book also touches on population control (which it comes down solidly against). In addition, there is a smattering of mild profanities that wasn’t present early in the series. In conclusion, while I didn’t always enjoy my visit to Dashner’s world, it was engaging, and I was driven to finish the series. It is violent, but it does celebrate some great qualities like bravery and loyalty and sacrifice. As I read each book of the series, however, I kept raising the appropriate reader age in my mind. Personally, I don’t think I’d let my kids tackle this one till high school (14+). Great review. It shows a lot of thought. Thanks for the age recommendations. It was a pretty gritty series. I LOVED book one. I kind of think he should have stopped there. The premise and setting of books two and three just didn’t compare. I’ve read a handful of reviews from others along those same lines as well. Book two, especially, was a bit disappointing, but there’s so much suspense that you have to read on!